An officer is a member of an armed force or uniformed service who holds a position of authority. Commissioned officers derive authority directly from a sovereign power and, as such, hold a commission charging them with the duties and responsibilities of a specific office or position. Commissioned officers are typically the only persons, in an armed forces environment, able to act as the commanding officer (according to the most technical definition of the word) of a military unit. A superior officer is an officer with a higher rank than another officer, who is a subordinate officer relative to the superior. Non-commissioned officers (NCOs) in positions of authority can be said to have control or charge rather than command per se; the use of the word "command" to describe any use of authority is often unofficial. Having officers is one requirement for combatant status under the laws of war, though these officers need not have obtained an official commission or warrant. In such case, those persons holding offices of responsibility within the organization are deemed to be the officers, and the presence of these officers connotes a level of organization sufficient to designate a group as being combatant. Commissioned officers generally receive training as leadership and management generalists, in addition to training relating to their specific military occupational specialty or function in the military. Many advanced militaries require university degrees as a prerequisite for commissioning, even from the enlisted ranks. Others, including the Australian Defence Force, the British Armed Forces, Nepal Army, the Pakistani Armed Forces, the Swiss Army, the Singapore Armed Forces, the Israel Defense Forces, the Swedish Armed Forces, and the New Zealand Defence Force, are different in not requiring a university degree for commissioning, although a significant number of officers in these countries are graduates. In the Israel Defense Forces, a university degree is a requirement for an officer to advance to the rank of lieutenant colonel. The IDF often sponsors the studies for its majors. In the United Kingdom, officers are commissioned both directly into the officer corps or from junior ranks as what are known as 'Direct Entry' or DE officers, or commissioned from senior ranks as 'Late Entry' or LE officers. LE officers, whilst holding the same Queen's Commission, generally work in different roles from the DE officers. In the infantry a number of warrant officers - class 1 are commissioned as LE officers. Commissioning for DE officers occurs after a 45 week course at the Royal Military Academy Sandhurst for regular officers or the Territorial Army Commissioning Course for Territorial Army officers, or for Royal Navy and Royal Air Force candidates, a 28 week period at Britannia Royal Naval College or a 30 week period at RAF College Cranwell respectively. Royal Marines officers receive their training in the Command Wing of the Commando Training Centre Royal Marines during a gruelling 15 month course. The courses consist of not only tactical and combat training, but also leadership, management and international affairs training. A smaller number of officers may be commissioned via other programs, such as the Marine Corps Platoon Leaders Class (PLC) during summers while attending college, or the Navy's since discontinued Aviation Officer Candidate School (AOCS) program, which also included the embedded Aviation Reserve Office Candidate (AVROC) and Naval Aviation Cadet (NAVCAD) programs. Others may attend precommissioning or post-commissioning officer indoctrination programs for officers in the medical/dental specialities, lawyers slated as JAG officers and military chaplains. 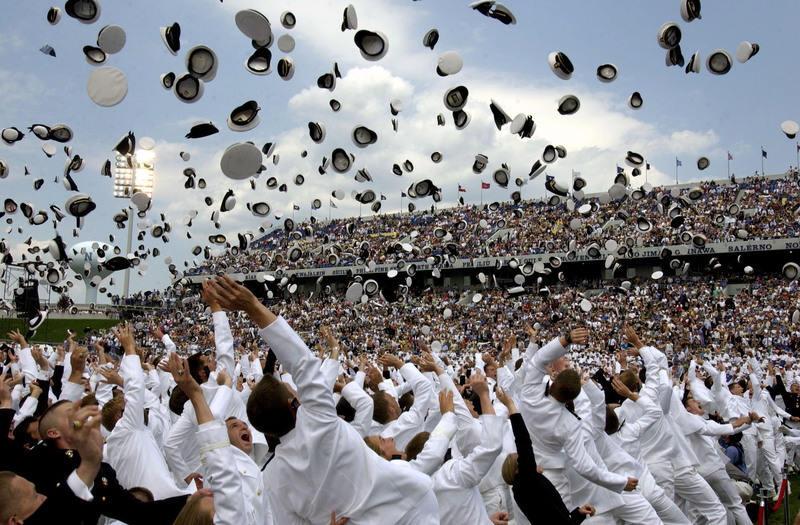 Graduates from the service academies attend their institutions in an active duty status for no less than four years and are commissioned immediately upon graduation. They compose approximately 20% of the U.S. armed forces officer corps. Other officers may be commissioned through the Reserve Officer Training Corps, which is the largest source of officers for the U.S. Army and the U.S. Air Force. ROTC is composed of small training programs at several hundred American colleges and universities. There is no Marine Corps ROTC program per se, but there exists a Marine Corps Option for selected midshipmen in the Naval ROTC program. The Coast Guard has no ROTC program. An officer may also be commissioned at a federal or, for a limited number of Army National Guard officers, at a state based Officer Candidate School. These schools train and commission college graduates and enlisted personnel toward being promoted to the commissioned officer ranks. In the U.S. armed forces, officers without a university degree may, under certain circumstances, be commissioned. These are typically the officers in the Limited Duty Officer (LDO) and Chief Warrant Officer (CWO) programs of the Navy, Marine Corps and Coast Guard. Officers in this category comprise less than 2% of all officers. The Air Force, in contrast, now requires all commissioned officers, regardless of background, to possess a minimum of a bachelor's degree prior to commissioning. Direct commission is another route to becoming a commissioned officer. Credentialed civilian professionals such as scientists, pharmacists, physicians, nurses, clergy, and attorneys are directly commissioned upon entry into the military or another federal uniformed service. However, these direct commission officers do not normally have command authority outside of their specific branches (e.g., US Army Medical Corps; US Navy and US Air Force Judge Advocate General's Corps). Such commissioning of civilians was widely used in World War II to bring industrial management expertise (for materiel production) and medical and surgical skills into the U.S. armed forces. LTG William S. Knudsen, with the highest-ranking such commission, is possibly the most famous example. In countries whose ranking systems are based upon the models of the British Armed Forces, officers from the rank of second lieutenant (army), sub-lieutenant (navy) or pilot officer (air force) to the rank of general, admiral or air chief marshal respectively are holders of a commission granted to them by the awarding authority. In Britain and other Commonwealth realms, the awarding authority is the monarch (or a Governor General representing the monarch) as head of state. The head of state often is granted the power to award commissions, or has commissions awarded in his or her name. Non-commissioned members rise from the lowest ranks in most nations. Education standards for non-commissioned members are typically lower than for officers (with the exception of specialised-military and highly-technical trades). Enlisted members only receive leadership training after they are promoted to positions of responsibility, or as a prerequisite for such. In the past (and in some countries today but to a lesser extent), non-commissioned members were almost exclusively conscripts, whereas officers were volunteers. A non-commissioned officer (NCO) is an enlisted member of the armed forces holding a position of some degree of authority who has (usually) obtained it by advancement from within the non-commissioned ranks. Non-commissioned officers usually receive some leadership training, but their function is to serve as supervisors within their area of trade speciality and, at lower NCO grades, they are not generally considered management specialists. Senior non-commissioned officers serve as advisors and leaders from the duty section level to the highest levels of the armed forces establishment. The duties of an NCO can vary greatly in scope, so that an NCO in one country may hold almost no authority, while others such as the United States and the United Kingdom consider their NCOs to be "the backbone of the military" due to carrying out the orders of those officers appointed over them. In most maritime forces (navies and coast guards), the NCO ranks are called petty officers and chief petty officers, with enlisted ranks prior to attaining NCO/petty officer status typically being called seaman, or some derivation thereof. In most traditional infantry, marine and air forces, the NCO ranks are known as sergeants and corporals, with non-NCO enlisted ranks referred to as privates and airmen. However, some countries use the term commission to describe the promotion of enlisted soldiers. Especially in countries with mandatory service in the armed forces, NCOs are referred to as professional soldiers, rather than as officers. In some branches of many armed forces, there exists a third grade of officer known as a warrant officer. In the armed forces of the United States, warrant officers are initially appointed by the Secretary of the service and then commissioned by the President of the United States upon promotion to chief warrant officer. In many other countries (as in the armed forces of the Commonwealth nations), warrant officers often fill the role of very senior non-commissioned officers. Their position is affirmed by warrant from the bureaucracy directing the force - for example, the position of regimental sergeant major in regiments of the British Army is held by a warrant officer appointed by the British Government. In the US military, a warrant officer is a technically focused, single specialty officer - helicopter pilots and IT specialists of the US Army, for example. They are given salutes and they are addressed as "Mr", "Ms", "Mrs", "Sir", or "Ma'am". There are no warrant officers in the U.S. Air Force. While the ranks exists in USAF, the last warrant officers retired in the 1980s. Each of the other U.S. Armed Forces have warrant officers — though each warrant accession program is unique to the individual service's needs. Because warrant officers normally have more years in service than regular commissioned officer counterparts, their pay is often slightly more than regular commissioned officers. In the United States armed forces, commissioned officers and commissioned warrant officers are the only officers allowed to command units. Officers in nearly every country of the world are segregated from the enlisted soldiers in many facets of military life. Facilities accommodating needs such as messing (i.e., mess hall or mess deck versus officers mess or wardroom), billeting/berthing, domiciles, and general recreation facilities (officer clubs versus NCO Clubs and CPO Clubs versus enlisted clubs) are separated between officers and enlisted personnel. This class system, historically correlated to socioeconomic status, is focused on discouraging fraternization and encouraging professional and ethical relations between officers and enlisted military personnel. Officers do not routinely perform physical labor; they typically supervise enlisted personnel, either directly or via non-commissioned officers. Commissioned officers will and do perform physical labor when operationally required to do so, e.g. in combat. However, it would be very unusual for an officer to perform physical labor in garrison, at home station or in homeport. ↑ "10 U.S.C. § 101". US Congress. 5 January 2009. http://www.law.cornell.edu/uscode/10/101.html. ↑ "NCOs are 'backbone' of the Army". US Army Public Affairs Office, Fort Monmouth, NJ . 15 April 2009. ↑ "Fraternization Policy Update Reflects Current Operational Tempo". US Navy Chief of Naval Personnel Diversity Directorate. 26 May 2007.